Give your truck an upgrade in horsepower with SCT X4 programmer. The X4 tuner will reprogram your ride to give it the ultimate boost in power, torque, and throttle response. You can gain up to 150 horsepower on your stock diesel truck or up to 74 ponies on your gas-fueled chariot. SCT X4 comes with a pre-loaded tune file that is proven to increase horsepower and torque. 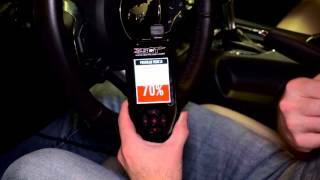 Also the X4 programmer can hold up to 10 custom tunes that can be created by a SCT custom tuning dealer. The X4 is a lot more than just a programmer it also comes with a LCD monitor that allows you to monitor all your sensor data like EGT temps and air-fuel ratio. 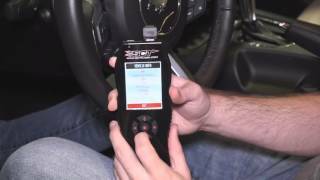 You can also record your vehicle's PCM data on the programmer or a PC. 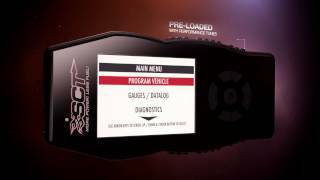 Installing the SCT X4 programmer is easy all you have to do is plug it in to the your OBDII port and follow that step by step instruction on the monitor. 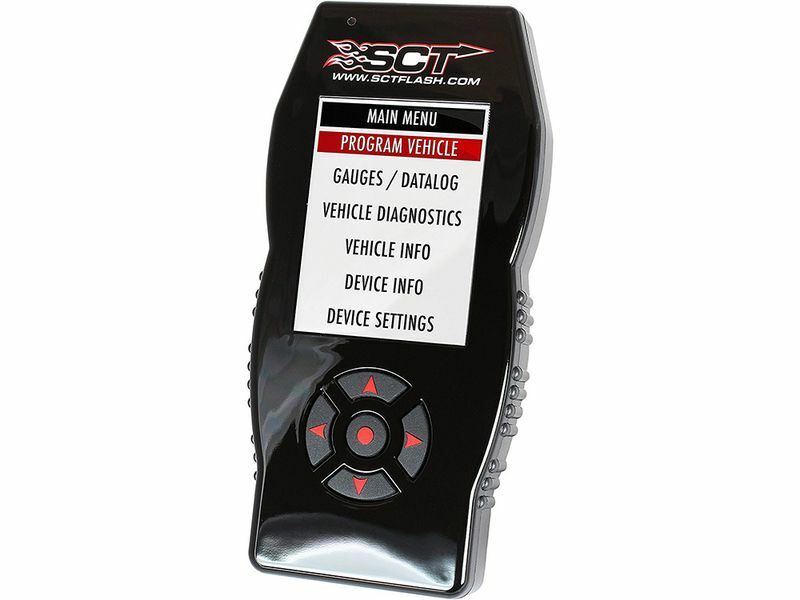 So if you want a reliable performance tuner that is DYNO tested to improve your horsepower, torque, throttle response and even fuel mileage in your truck, than the SCT X4 programmer is for you. What are you waiting for? Give your truck a big boost in power today! For a full list of the all the things that can be adjusted with an X4, please see the list below. This warranty covers any defects or malfunctions in your SCT tuning product within the warranty period set forth below, subject to the following conditions and limitations. This warranty lasts for a period of one (1) year following the date of sale by SCT of the product to the original SCT dealer/distributor; provided, however, the duration of this warranty will be extended to one (1) year from the date of original purchase by the consumer from the SCT dealer/distributor so long as the consumer submits the required online registration information within thirty (30) days of purchase, as provided below. All implied warranties, including warranties of merchantability and fitness for a particular purpose are limited to the warranty period set forth above. SCT will, at its option and as its sole obligation under this warranty, replace, repair or refund the purchase price of any SCT product that has a defect(s) in manufacturing, material and/or workmanship provided that SCT is notified of the claim within the warranty period provided herein. SCT will not be liable for, nor will it reimburse the consumer for any fees, charges or expenses for shipping and/or handling costs associated with the return to SCT of any defective products sent in for replacement or repair. Any damage and/or other problem(s) caused by abuse, misuse, neglect, vandalism, accident, act of God (e.g., flood, fire, lightning), or other cause beyond the reasonable control of SCT is/are not covered. Also, any damage or problem resulting from faulty or improper installation is not covered and shall be the responsibility of the installer. SCT IS NOT LIABLE FOR AND HEREBY EXCLUDES ANY AND ALL INCIDENTAL, SPECIAL OR CONSEQUENTIAL DAMAGES RELATING TO THE PRODUCTS COVERED BY THIS WARRANTY. This is the consumer’s exclusive warranty and is in lieu of all other warranties, express or implied, except as may be required by applicable law. Without limiting the generality of the foregoing, SCT shall not be liable for any breach of any other written or oral warranties given to the consumer by any third party(ies) such as those (if any) given to the consumer by dealers or distributors of the products. In order to be eligible for service under this warranty you SHOULD complete the online registration information within thirty (30) days of purchase. To register your SCT product, please log on to www.sctflash.com, click on “Register Products” and follow the simple steps provided on the website. If you do not have internet access, or encounter difficulties with the online registration process, please contact SCT at 407-774-2447. To initiate a claim under this warranty, you can call 407-774-2447 and instructions will be provided. While preregistration of your SCT product is not mandatory, it will expedite the warranty claims process. Can This Warranty Be Transferred? This warranty is not transferable and applies only to the consumer who originally purchased the SCT product. This warranty gives you specific legal rights, and you may also have other rights which may vary from state to state. Some states do not allow the exclusion or limitation of incidental or consequential damages so the above limitation or exclusion may not apply to you. Some states do not allow limitations on how long an implied warranty lasts, so the above limitation may not apply to you. SCT Performance, LLC (the “Seller”), shall not be responsible for the Product’s proper installation, use and service. If you choose to install and use the Product without a dealer’s assistance, you assume full responsibility for the proper installation and application of the Product. If the Product was installed and/or programmed by a dealer, the Buyer shall look solely to the dealer who installed the Product and/or programmed the vehicle with respect to any responsibility for the installation or application of the Product, the programming of the vehicle, and any service and support needed by the Buyer with respect thereto, as well as any damage that may be done to vehicle components as a result of modifications made by the dealer. The Buyer is responsible to fully understand the capability and limitations of his/her vehicle according to manufacturer specifications, warnings and instructions and agrees to hold the Seller harmless from any damage or injury resulting from failure to adhere to such specifications, warnings and/or instructions. The Buyer is also responsible to obey all applicable federal, state, and local laws, statutes, and ordinances when operating his/her vehicle, and the Buyer agrees to hold Seller harmless from any violation thereof. The Seller’s Limited Warranty for this Product is the Buyer’s exclusive warranty and is in lieu of all other warranties, express or implied, except as may be required by applicable law. Without limiting the generality of the foregoing, the Seller shall not be liable for any breach of any other written or oral warranties given to the Buyer by any third party(ies) such as those (if any) given to the Buyer by dealers or distributors of the Product. Operate your vehicle at all times in a safe manner. Regardless of any capability, feature or function of the Seller’s Products, the Buyer understands and acknowledges that it is the Buyer’s sole responsibility to ensure that (A) the motor vehicle is operated in a safe and legal manner, (B) the motor vehicle is not driven faster than the lower of the speed limit or the speed rating of the tires on the vehicle in which the Seller’s product is installed, and (C) the maximum RPM or speed rating of the engine is not exceeded while operating the motor vehicle. In no case will the Seller be held liable, and the Buyer assumes all risk and responsibility, for any property damage, personal injury and/or death that may occur in the event the Buyer operates the vehicle in an unsafe manner, violates the law or exceeds the above mentioned limits. Please check your local, state and federal laws to determine if you are within your rights to modify your vehicle’s controller. The Seller makes no representation or warranty, express or implied, that the use of its Products will comply with local, state, or Federal emission levels, noise levels or safety standards. The Buyer assumes all responsibility for such use and compliance. The Seller recommends that the Buyer temporarily remove this product from his/her vehicle when having the vehicle serviced by a dealership or other service facility. Failure to do so may cause erroneous diagnostic readings or misdiagnosis of vehicle problems. The Seller assumes no liability for failure to do so. Without limiting the foregoing, should the Buyer decide to conduct any performance tests in connection with the use of Seller's Products (including but not limited to tests in conjunction with the performance screens of any such Products), such performance tests should (A) only be conducted by a passenger in the vehicle (to avoid distracting the driver) and on a closed course and (B) never be conducted on streets, highways or other public ways. The Buyer acknowledges that he/she is not relying on the Seller’s skill or judgment to select or furnish goods suitable for any particular purpose, and the Buyer hereby waives all remedies or liabilities, expressed or implied, arising by law or otherwise, or whether or not occasioned by the Seller’s negligence. THE BUYER HEREBY WAIVES ALL LIABILITY CLAIMS AGAINST THE SELLER OF ANY KIND OR NATURE, INCLUDING LIABILITY FOR PROPERTY DAMAGE, PERSONAL INJURY OR DEATH, TO THE FULLEST EXTENT PERMITTED BY LAW. ADDITIONALLY, BUYER ACKNOWLEDGES AND AGREES THAT SELLER IS NOT LIABLE FOR AND HEREBY EXCLUDES ANY AND ALL INDIRECT, INCIDENTAL, SPECIAL OR CONSEQUENTIAL DAMAGES RELATING TO THE PRODUCTS COVERED BY THIS DISCLAIMER. The Seller’s Limited Warranty for this Product gives you specific legal rights, and you may also have other rights which may vary from state to state. Pertinent state law shall control for what period of time following the sale a consumer may seek a remedy under the implied warranty of merchantability or fitness for a particular purpose. Some states do not allow the exclusion or limitation of incidental or consequential damages so the above limitations or exclusions may not apply to you. THIS DISCLAIMER IS A MATERIAL CONDITION OF SELLER’S WILLINGNESS TO SELL THE PRODUCT TO BUYER. IN THE EVENT THAT THE BUYER DOES NOT AGREE WITH THIS DISCLAIMER, THE BUYER MAY PROMPTLY RETURN THIS PRODUCT, IN A NEW AND UNUSED CONDITION, WITH A DATED PROOF OF PURCHASE, TO THE PLACE OF PURCHASE WITHIN FOURTEEN (14) DAYS FROM DATE OF PURCHASE FOR A FULL REFUND. Installing the SCT X4 programmer is simple, comes with clear cut directions. Should only take about a few minutes to plug it in to your OBDII port and go through the step by step instructions on the monitor. However if you have any questions please give our amazing customer service a call at 877-216-5446.